The remaining land snails in Hawaii face imminent extinction threats from invasive species and climate change. 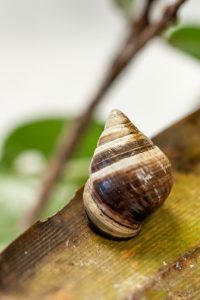 The Snail Extinction Prevention Program (SEP) is featured prominently in the upcoming television documentary, Forests for Life, which chronicles the vital importance of Hawai‘i’s native forests to all life in Hawai‘i. The hour-long special, considered the most comprehensive look at all the benefits native forests provide and the threats they face, debuts on KFVE-TV (K5), at 7:00 p.m. on Friday, Jan. 18th with a repeat on Monday, Jan. 21, 2019 at 8:00 p.m.